A Connecticut-based industrial manufacturer won a new piece of business that would increase the gross sales of the plant by over 20% per year. It was a huge undertaking, since the required per day part output was more than triple their next-highest production line, so they knew they had to get it right from the beginning. New England Lean Consulting helped facilitate a 5-day 3P (Production Preparation Process) event to ensure that the assembly line layout supported one piece flow and proper ergonomic considerations for front line workers. Members of the 3P were carefully chosen to represent a cross-functional team including manufacturing engineers, designers, assemblers, project management and shop floor supervision. By including all applicable disciplines, we ensured that all perspectives were taken into account, thus guaranteeing that we didn’t miss anything along the process. 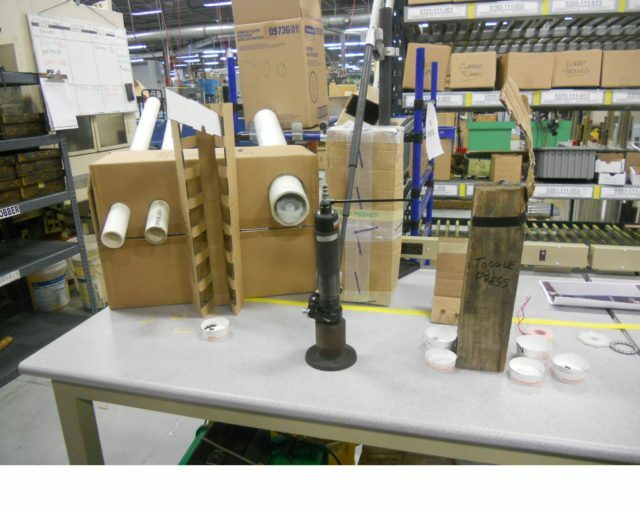 As the team progressed through the 3P process, they mocked up the production line using cardboard and PVC pipe. When actual part samples were not available, they used other pieces to mimic the size and shape of the missing components. By going through this exercise, it made the production line come to life, making issues and problems easy to see. Likewise, I was a way to engage the future line workers and solicit their input about fixture and par feeder placement. After the line had been laid out and refined, no fewer than 21 design changes to aid in Design for Manufacturability (DFM) were identified. The changes ranged from the simple to the complex, and by employing an inter-disciplinary partnership approach, all of them were acted upon. By addressing those issues up-front, many future problems, costs and setbacks were avoided, allowing the production line to be commissioned 3 months ahead of schedule and under budget to the delight of the customer. So much so, in fact, that the company has been approached with more future business that they initially were not in the running for.